Saturday May 11th, 2019 – The Official NYC Saturday Midnight Booze Cruise Spring Kickoff Yacht party at Skyport Marinas Cabana Yacht. Group of 5 discount 75$. 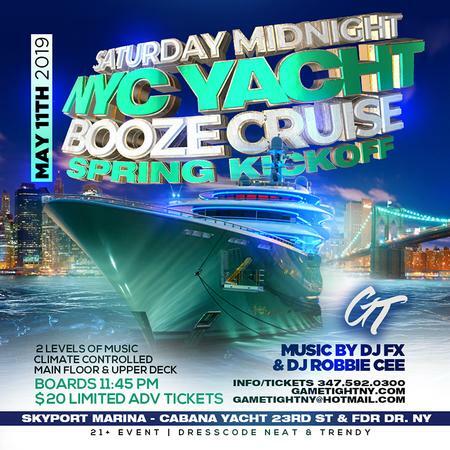 Saturday May 11th, 2019 – The Official NYC Saturday Midnight Booze Cruise Yacht party at Skyport Marinas Cabana Yacht located at 2430 Fdr Drive Service Road East New York, NY 10010. Join us at the Official Hottest NYC Booze Cruise kickoff Saturday in New York with NYC Hottests Djs partying along New York Cities Skyline.